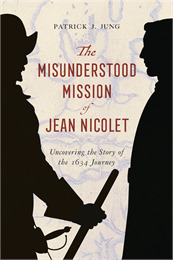 Join historian Dr. Patrick Jung for a discussion of his book The Misunderstood Mission of Jean Nicolet: Uncovering the Story of the 1634 Journey. For years, schoolchildren heard the story of Nicolet's arrival in Wisconsin. But the popularized image of the hapless explorer landing with billowing robe and guns blazing, supposedly believing himself to have found a passage to China, is based on scant evidence--a false narrative perpetuated by fanciful artists' renditions and repetition. In more recent decades, historians have pierced together a story that is not only more likely but more complicated and interesting. Jung synthesizes the research about Nicolet and his superior Samuel de Champlain, whose diplomatic goals in the region are crucial to understanding this much misunderstood journey across the Great Lakes. Additionally, historical details about Franco-Indian relations and the search for the Northwest Passage provide a framework for understanding Nicolet’s famed mission. The next event in the series will take place Tuesday, May 21. The site is fully accessible to visitors requiring a wheelchair for mobility.